In order for an organization to be more 'conscious', it would have to understand what that means. Consciousness is not an 'airy fairy' concept. Raising it has real results for organizations. I get questions such as: How can employees get more motivated? Why is it so difficult to retain employees? How can an organization attract talent when they can't pay top rates? Why is there so much conflict? How can an organization get loyal customers? How can an employee be disciplined when he/she does wrong? The full list is much too long for a blog, but you get the picture. Well, part of the answer is: because the organization and the individuals in it need to raise their consciousness. Survival - Focusing on profits and shareholder value. An organization at this level is creating financial stability and a healthy and safe environment for employees. Relationship - Employee loyalty and customer connection are fostered. Self-esteem - Employee pride is created through high performance systems and best practices. Transformation - This level is about adaptability and learning. Employees have responsibility, accountability, and decision-making input. Innovation, continuous improvement, and personal development are fostered. A shift from fear-based governance to open and empowering leadership takes place. Internal cohesion - Employees' motivations are aligned around a singular mission, inspiring vision, and a shared set of values. The result is passion, creativity, and enthusiasm. Making a difference - Creating strategic alliances with other organizations and the community and fostering cooperation between business units. Service - Humility, forgiveness, and compassion are cultivated internally. The organization collaborates with stakeholders and other organizations to enhance sustainability of humanity and the planet. When an organization operates in the lower levels of consciousness only, it will face engagement and performance challenges and struggle with being market leaders. However, these levels are the foundation for business effectiveness. The higher levels of organizational consciousness bring long-term sustainability and engaged employees. Like the lower levels, though, if an organization focuses only on these levels, it will lack the proper infrastructure to operate and perform effectively and efficiently. 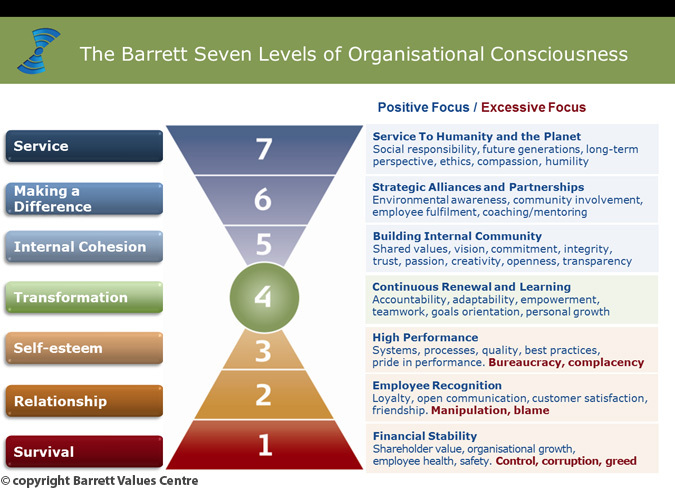 The most effective organizations will master each of the seven levels of consciousness through their systems, processes, communication, culture, leadership, relationships, strategies, and social responsibilities. It is rare for an organization to conquer all seven levels, but imagine the possibilities when they do! The good news is that consciousness CAN be raised, both individually and in a group, through reflection, coaching, training, culture change, strategic information sharing, and other techniques. What levels of consciousness has your organization achieved? What can you do to improve your and your organization's consciousness?